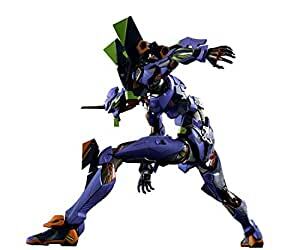 Highly detailed die-cast eva-0 action figure from neon Genesis Evangelion. Re-designed from the ground up, this incredibly posable portrayal of the eva-01 is packed with visual detail and play value. Includes four pairs of optional hands, a progressive knife, a magoroku exterminate sword, a pallet rifle, a handgun, a pallet knife full option, an umbilical cable, a mounting joint, an optional head with goggles, shin armor, a support rod, and a display stand with cage. The designer of Evangelion, ikuto Yamashita, has joined forces with band a I to create this metal build edition of the famed character, capturing its steel-and-muscle appearance like no other figure has before. The body features die cast metal parts and chrome plating for a luxurious weight and finish. Re-designed from the ground up, this incredibly posable portrayal of the eva-01 is packed with visual detail and play value. The set includes four pairs of optional hands, a progressive knife, a magoroku Exterminate sword, a pallet rifle, a handgun, a pallet knife full option, an umbilical cable, a mounting joint, an optional head with goggles, Shin armor, a support rod, and a display stand with cage.